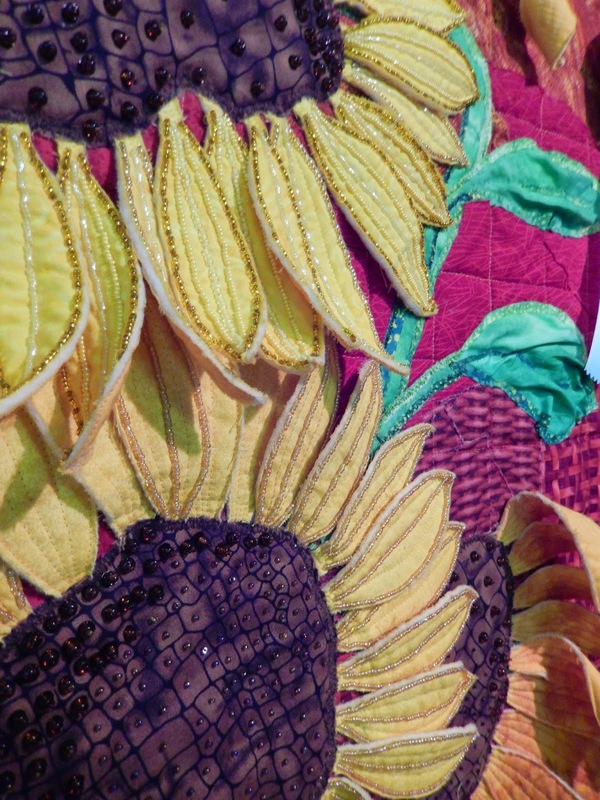 Welcome to Quilt Fiesta, hosted by the Northern New Mexico Quilt Guild. 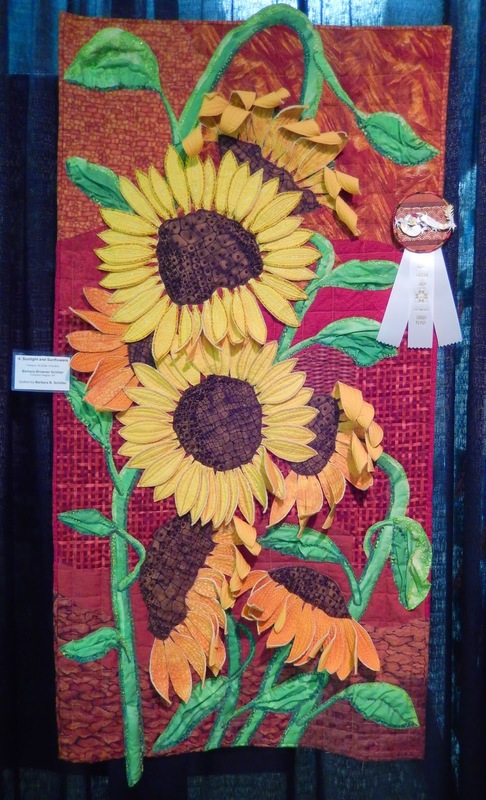 Today, let's take a tour of the art quilts. While this is a venture from our usual modern programming, I thought you might appreciate the artistry. If you missed my post featuring modern quilts from the show, go ahead and check it out, I'll wait for you. First up is Kamchatka by Nancy Steidle. The way the river flows into the border is impressive. She truly captured the colors of nature. 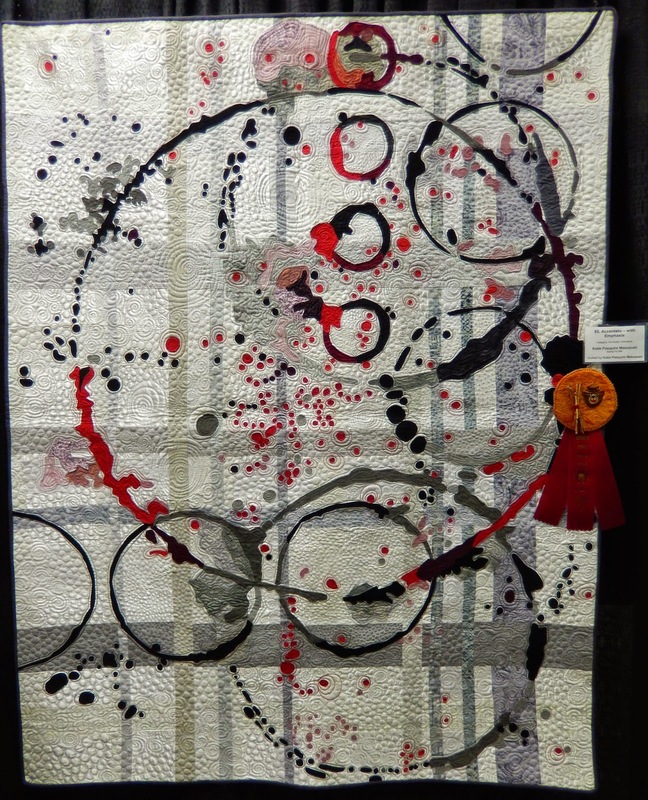 Nancy Steidle describes her work, "Cotton batik fabrics, pearl cotton, wool yarns, glass beads, cotton and wool batting. Hand appliquéd, machine pieced, hand embroidered, hand and machine felted, machine quilted, hand beaded." Look closely, and you can see the hand embroidery, textural fibers, and use of decorative thread work. Katie Pasquini Masopust is a well-known quilt artist. Her piece Accentato - with Emphasis was inspired by a painting. "This wall hanging was inspired by the incredibly beautiful and glorious sunflowers I see at the Santa Fe Farmer's Market," Marbara Browner Schiller tells of her inspiration for Sunlight and Sunflowers. Her piece features intricate beadwork, excellent fabric choices, and three-dimensional elements. "The art quilt is an original design depicting the many fascist of creativity that originate from the wellspring of the imagination," Crea Lynn wrote of Imagination, her mesmerizing fabric collage. Marily Bennett speaks of A Long Drink of Water, "My life-long love for the giraffe led me to take on the challenging paper piecing of Linda Hibbert's delightful pattern." "Original design by me showing figures springing up in joyous celebration of sunset -- the most colorful time of day," Barbara Bogart tells of The Three Graces in Flights of Joy. Three unique pieced backgrounds nicely accentuate the trio of silhouettes. Jennifer Day an uber talented local sew-lebrity. Her incredible thread painting titled Carson and Friend has a backstory. "Carson and his friend "Killer" the cat were at the ranch on a cold winter day. They were enjoying the crisp air and Killer was thinking about mice!" Look closer, and you'll believe Killer is up to something. Ancients at the Deep by Sally Williams is beautiful and educational. "Latimeria chalemnae: a living fossil, coelacanths are the oldest living lineage of Sarcopterygian fishes," Sally elaborates. Good thing there's not going to be a quiz, Sally! Thanks for sharing this incredible show. I really had my doubts about that portrait with the cat... I thought you must have wandered into the photographic part of the show. Good thing you showed a close-up. I would never have believed there were stitches in that picture. I felt like I could pet the cat, but might get bitten. Amazing. Yep, it's a good idea to use caution when considering showing affection to anything with the nickname Killer. I know Jennifer does begin with a photograph printed on fabric, but then she covers it with such a density and variety of thread that the photograph no longer shows. 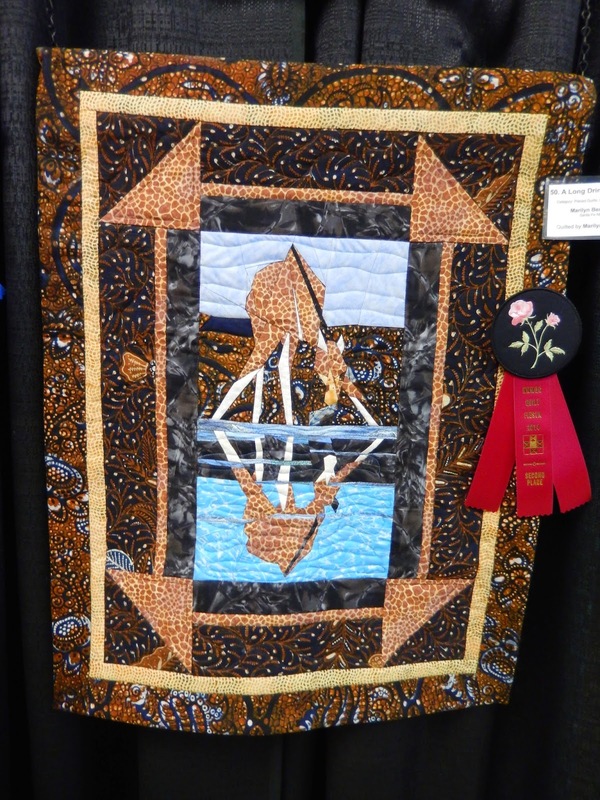 My local guild, NMQA, is hosting her as a guest teacher, except it is during Quilt Con. Nooooo! Beautiful collection!! Thank you so much for sharing!! You are very welcome. Thanks for dropping by Quilting Mod. Wow. Accentato with Emphasis is the most beautiful quilt I have ever seen. Bravo.